Home Bride	Designer Diaries : An Exclusive Interview with Shubha & Siddhi from BodhiTree Jaipur. 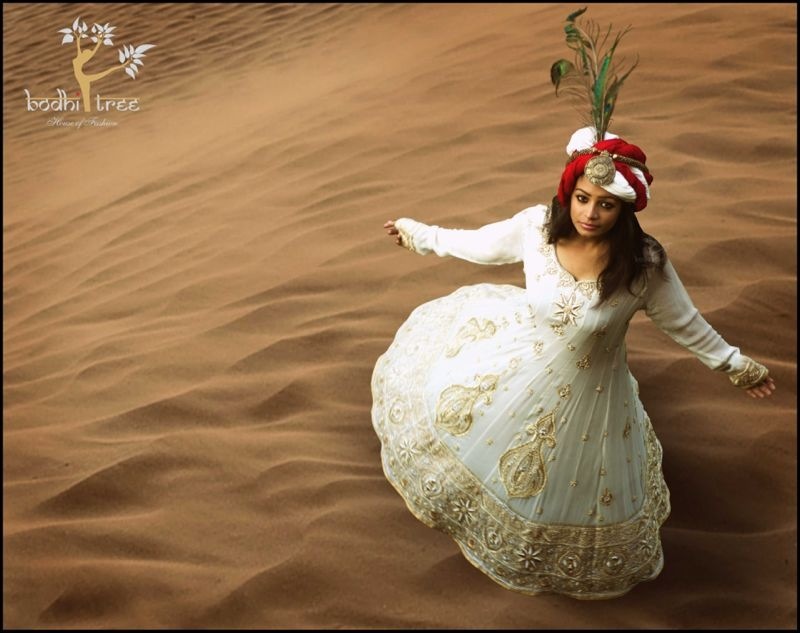 Designer Diaries : An Exclusive Interview with Shubha & Siddhi from BodhiTree Jaipur. 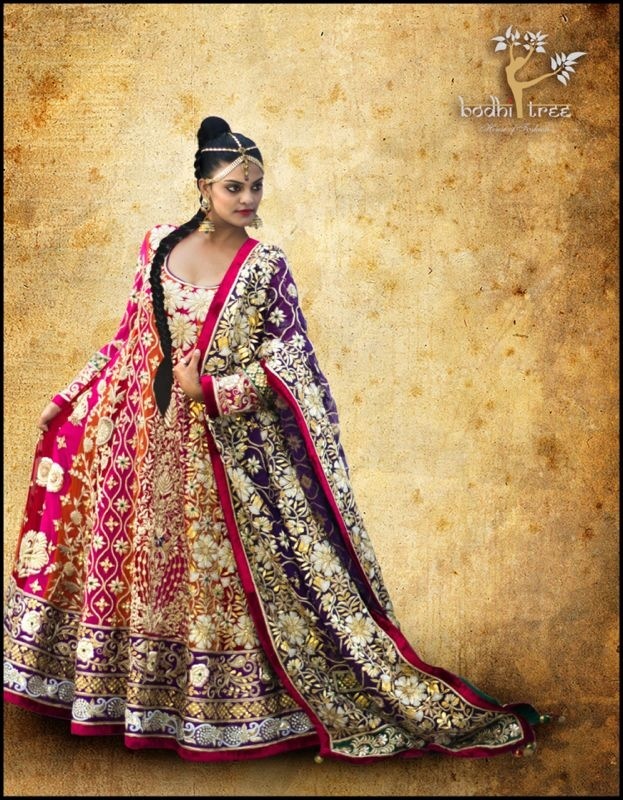 In my search for Rich and Elegant Ethnic indian designs and traditional rajasthani work, I found BodhiTree Jaipur online. Here are some excerts from my conversation with designer duo Shubha and Siddhi from BodhiTree. Tell us something about your Fashion Brand. BodhiTree: The story goes back in time when we were on the lookout for traditional Indian Attire. Having belonged to a family where women have an appreciation for all things beautiful, the market failed to satisfy our craving for ethnic and beautiful Indian attire. It dawned on us to offer to the ladies something combining our aesthetic sensibility and thus began our journey to recreate old world charm with the wedding ensembles. What is the essence of your Fashion Brand? BodhiTree: Through our designs we try to recreate the glory and grandeur of the bygone era. The focus is on combining rich and luscious fabrics with opulent and extravagant long lost techniques of hand workmanship like danka, antique dori, zardozi etc. Our brand is an ode to women who feels beautiful, confident and exudes feminism and possesses a queen like aura. 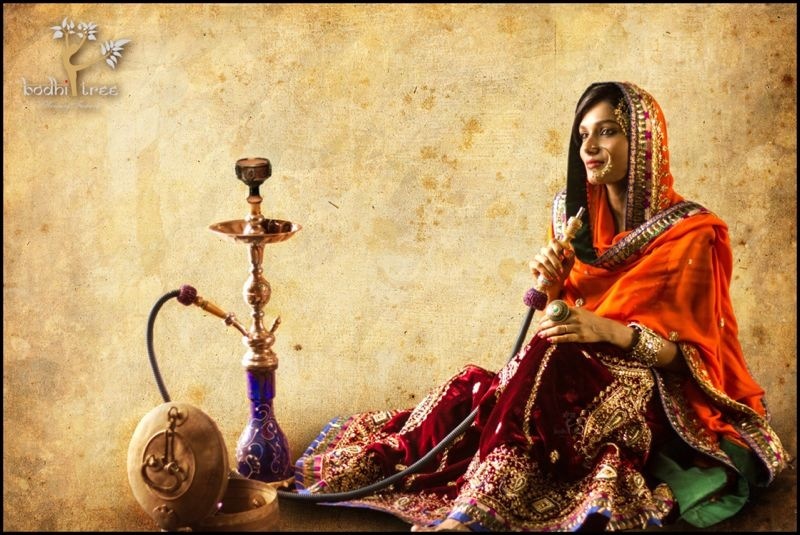 Which area of Indian fashion do you specialize in? BodhiTree: At our Studio, we emphasis on reviving the age old techniques of workmanship like zardozi, gotta, antique dori, danka, resham, aari, mirror work and beading, dabka and kasab work and present them in a contemporary manner that is appealing to present day fashionistas. We specialise in making glamorous wedding ensembles that become an integral component of a bridal trousseau and which can be bequeathed to posterity. What is your favourite aspect of Indian fashion? 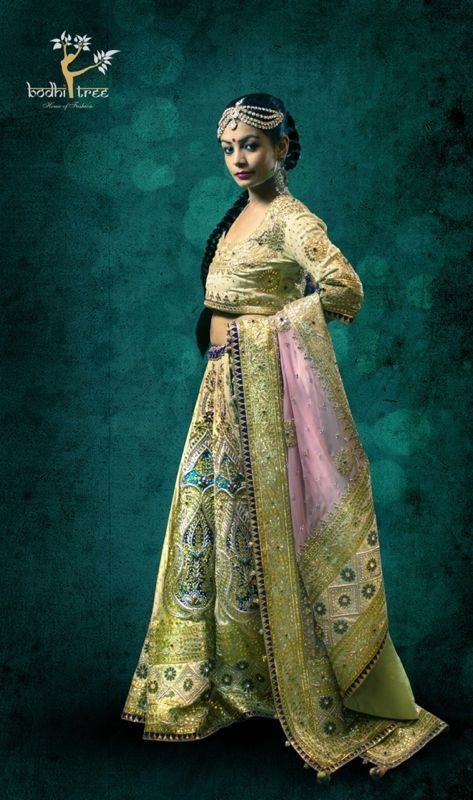 BodhiTree: Indian fashion has now come of age and is pushing its own boundaries. Indian hand techniques and motifs are frequently gracing the international runways. It’s a proud moment to be part of Indian fashion industry. As a designer what is your biggest challenge? BodhiTree: We as a brand have taken upon us to contribute nothing but the best in terms of creativity, designs, following stringent quality standards and sourcing the best materials available. We desire to impart those skills to our workers that would help them incorporate old techniques in their workmanship. This would enable us to segregate our work from run of the mill workmanship and inferior copies, which has infiltrated the market and thus achieving ultimate satisfaction for the Bodhitree patrons. Where can one find your Collection? BodhiTree: Customers can visit our store in Jaipur (on prior appointment basis). On request of our online customers we are announcing the launch of our facebook store very soon, wherein customers in India and abroad would be able to see and buy from our latest Pret line (casual, semi-formal and formal sarees, suits, lehengas and tunics). Our couture collection will be showcased in Delhi from 6th to 8th Sept at Hotel Ashoka and for the first time ever in Pune from 4th-6th October at Hotel Le Meridian. To get the latest updates of our shows and new collection you can visit our Bodhitree Jaipur Page. Tell us something about your latest collection? BodhiTree: Our latest collection is an ode to the insatiable desire of a woman to look the most beautiful in every moment of her life. It’s a celebration of extravagant and grandeur life in itself. It is akin to royalty being seen from the eyes of an aesthete traveller “A Royal Ghumakkad” who is mesmerised and awestruck by the grandeur of it all. Keeping true to our spirit, it’s a collector’s delight exuding traditional charm. Do you take up custom design requests? BodhiTree: Yes we do take customised design request orders. Please contact us through our facebook page or email us at bodhitree9@gmail.com and we will be happy to discuss your details and customize the outfit as per your request. What is your advice on dressing style for different body types? BodhiTree: The most important aspect is to know your inner self and channelize the dormant diva in you so that you exude confidence outside. Women with any body type have the potential to look good it’s just that they have to know their body, cuts and colours which compliment them the most instead of blindly aping the runways. But it comes gradually thru experimentation and then it becomes natural. So be open to exploring new horizons. Ladies please be an aware buyer and invest in statement pieces which are stylish, chic and cyclic in nature so that they can be reused in many ways. BodhiTree: Wishing all the gorgeous ladies out there to stay stylish and happy dressing and celebrate the everlasting occasion called life. We would also take this opportunity to thank our patrons for showering so much love and appreciation on us. It motivates us and helps us to strive for more. Bodhitree, Jaipur is the brainchild of sister designer duo Shubha Gupta and Siddhi Gupta and is an ode to glory of Rajasthan’s royal and vibrant cultural heritage. It is an amalgamation of rich handpicked fabrics with opulent embroidery and embellishments oozing grandeur and opulence. Our wedding ensemble embodies the old world glamour keeping the subtle and chic aesthetic sensibilities in mind. We take pride in our selves in endeavouring the best business practices and maintaining integrity and quality and offer complete value for money. Bodhitree epitomise all things luxurious and covetable.